Home Uncategorized Buy Akash Tab 2 online for Indian Students only Rs. 1,130. 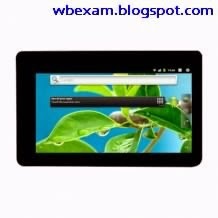 Buy Akash Tab 2 online for Indian Students only Rs. 1,130. Are you want to buy Akash Tab 2 with students price ? Know all the details about new Akash Tab 2. All the key features and price of Akash Tab 2. Get all the information about Akash Tablet PC. Know how can you buy this PC online and all the details. Ubislate and Human Resource Development Commission has launched world’s first cheapest Tablet PC, named Akash Tab. Its first version become not so popular. And now it was banded. On 12th September, 2013 President Pranab Mukherjee realised the new version on Akash Tab and named Akash Tab 2. This Tablet PC is distribute Indian students. It will helps them on their study. Government want to give computer Tablet on low price to all over the India. The market price of Akash Tab 2 is Rs. 2,263/- only. But Govt. buy this PC from Ubistalite and distribute among the Indian students with 50% discounts. So students can buy this tablet PC only Rs. 1,130/-. If you want this Tab on students price (Rs. 1,130/-) than I will disappoint you. As, this product is only available with students price on some selected colleges and Universities in India. So you must wait some months or year to get this Akash Tab 2 with discounts. But now, if you want this, than you can order it online. And the price of Akash Tab 2 is Rs. 3,450/-. You can order your Akash Tab 2 on this website www.akashtablet.com. You can pay the price by Cheque, Net Banking, Using Credit or Debit Card or Home delivery. Chose your paying methods and collect Akash Tab 2. You can collect it within 7 working days. •Akash Tab 2 comes with Touch screen. • It has 7-inch capacitive display and 800*480 pixel Resolution. • Akash Tab 2 has 512MB RAM and 32 GB Expendable Memory. • 1GHz Cortex A8 processor. • 4GB storage and microSD card slot. • Wi-Fi, WEB, GPRS, E-Mail connectivity. • Over 19,000 apps download. So order your Akash Tab 2 now. And get a new education world around you. When this tablet available with students price we will inform you. Hai sir I am pursuing final year ece,how to purchase this tab.